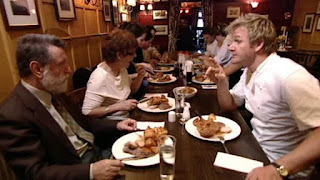 In this Kitchen Nightmares episode, Chef Gordon Ramsay visits The Fenwick Arms, Claughton, Lancashire, where he meets Brian and Elaine, running a country pub like an upmarket restaurant. They are losing £6000 a month and the dining room is set up for full silver service. They tell Gordon that work 100-120 hours a week and don't take any time off, Brian was at work 7 days after a triple heart bypass. Gordon orders an over complicated prawn salad and a rack of lamb, that is like chewing a golf ball. Elaine admits that they would owe £250,000 if they were to close the restaurant today. Gordon watches a dinner service and finds that Brian has to set a timer for every dish he cooks, he runs around the kitchen and Chef Nathan simply garnishes the food. Gordon is shocked to find the kitchen is so overcrowded with equipment that they struggle to get around and he confesses that he loves plates. Gordon hires a skip and tasks Brian with deciding on what has to go, he finds reasons to hold on to almost everything. But the stock pot and more is thrown away. For the evening service, Gordon moves Brian to front of house as that they can run the kitchen in Brian's absence. Brian struggles at the front of house but with in the kitchen, things run smoothly and the food leaves the kitchen quickly. Gordon tasks Brian and Elaine with simplifying the menu and also gives them the evening off as they will be coming to the pub to have dinner. They arrive dressed formally and Gordon refuses to let them in until they are dressed informally. They are impressed with the new food and the service. Gordon disposes of Brian's revolting gravy and makes a new home made, fresh gravy. They take to the streets to promote the real gravy with Yorkshire puddings. Brian is tasked on selling his plates on eBay whilst Gordon talks to Elaine about keeping Brian out of the kitchen. For relaunch, the menu has been simplified and Karen is put in charge in the kitchen. The customers are enjoying the food but the service needs attention, the first customers are still on the tables. Brian steps up and turns the tables and the second sitting is as successful as the first. Overall, the relaunch is a success and the real gravy is a big hit. Gordon revisited and only one of the original chefs was still there. Brian was back in the kitchen, controlling the menu and morale was low, with most of the staff looking to leave. The plates had started to emerge and a rival pub "The Highway Man" had recently opened down the road and had noticeably affected their business. In 2009, Brian and Elaine moved to The Ship Inn in Aldborough, claiming that the new menu at the Fenwick drove away trade. The pub was bought by new owners and had a major revamp. However... In 2011 the pub closed and was put up for sale. The Fenwick Arms reopened in June 2013 as a pub and seafood restaurant and Trip Advisor reviews are excellent. The Fenwick Arms aired on November 14 2006, the episode was filmed in August 2006 and is Ramsay's Kitchen Nightmares UK season 4 episode 2. Brian and Elaine are now at the Ship Inn in Aldborough, advertising "real pub food" but serving the same stuff Ramsay took off their menu at Fenwick Arms. Pseudo posh food drowned in more gross sauces. How many times does a person need a smack in the head to finally learn??!! Agreed, some people will just never change their ways. Aw, Brian seems a sweet ole boy to me. He just doesn't belong in 'his version' of a pub is all. Sadly though, he seems drawn to the notion but its both too much for him the way that he would involve himself and 'his version' makes it even more difficult. If anything, with all those heart attacks, its time for him to just sit back and relax. He is just to set in his ways. The critical comments are mainly redundant as this is probably the most welcoming and successful pub in the area. After 10 years of downward trend when the previous owners sold to the brewery this lovely old proper English village pub has been lovingly brought back to it's former glory. Roaring fires and mouth watering menu's, great Sunday roasts all make this the huge success it is. We wonder if there are some sour grapes going on here??? Anonymous on March 28, I was about to post the same thing, lol. Brian does seem sneaky enough to do it, in my opinion. Brian is what they call a "right-fighter"..stubborn & insists on being the chief. Elaine is his enabler. What struck me most about him is that he lives such a lonely life. He was painfully uncomfortable around the patrons & couldn't even make small conversation. Sad, really. strange Gordon said I talked too much to the customers and a crew member was timing me with a stop watch with each customer, 2 minutes for up to 4 customers. You will see on here the only comment written by me has my name on it. Yep, I thought the same thing! What's the chance that a bunch of different people would all find the same website and write a bunch of similar reviews within a few days of each other? What a fool. There are some bad reviews on TripAdvisor, and they actually responded to reviews. One person complained about the bad chips, and they responded that the chips were that way because of the weather conditions. Idiots! Then a person complained about too much fat in a pot pie, and Brian WEIGHED THE FAT that was left on the plate to prove it wasn't that bad. Seriously!? These people are insane, can't take criticism, and have no business being in the service industry. Go and read their TripAdvisor comments for a good laugh. one of our customers found the site and it was the talking point in the bar, and they disagreed with the comments hence them writing in. I know this is older and may not be seen. Brian. Please do not respond to the comments here. You are great chef and friendly person. Its not worth responding to anyone. You do not have to defend yourself. These people making comments are basing their opinions off a TV show. The reviews I write have my name on not someone elses.The wet weather has produced the lowest yeid and poorest quality potato since 1976. When a potato becomes chilled in cold weather ( which we have had ) through either being stored at very low temperatures it undergoes a change that converts some of the starch ( high starch content makes it worse) to sugar to provide energy to combat the cold. I had thee best laugh with the Gravy Parade! As for "the new menu drove away trade"... I don't believe it for one bit. The business was in dire straights and that's why they invited Ramsay to begin with and you can see the business was bustling even a month later when Ramsay did the revisit. Regardless though, glad to see Elaine and Brian doing well with the new restaurant and I would bet the location and the much nicer looking establishment is whats making it more profitable. 1) Do you feel as though Ramsay hurt your business? 2) What percentage of the show was real? 3) Are you still cooking? 4) Are you still making "real gravy"? I looked at your menu at The Ship and it looks to me like you took to heart a lot of things Ramsay said, because I don't see the extravagant over the top dishes... they seem more contemporary and pubish. Also chuckled when I saw the "Infamous in the glass" prawn cocktail. Good stuff... and wish you both many years of success. And a sidenote: Would love to come visit over there but probably won't ever be in the financial situation... as I am in America. Brian proceeds to blame Ramsay and his menu for going out of business and not his own fake- wannabe posh menu, mismanagement, stubbornness, etc. Yet, after opening his new place the food looks strikinlgy similar to Ramsays concept (look at pics on tripadvisor). Very simple, rustic, down to earth food. What I find hilarious is that while working for 100 hrs+ a week, Brian still has the time to browse through the internet leaving several obvious fake comments (similar wording, rhetoric) from fake accounts to praise himself and his new restaurant. This was the first episode of Kitchen Nightmares I ever saw, broadcast on BBC America. The beginning of an obsession!